Michael McGraw: Art-A-Whirl Open Studio Extravaganza--This Weekend! Art-A-Whirl Open Studio Extravaganza--This Weekend! In the Spring and Fall, NE MPLS artists open their studios for a grand art crawl. It's huge and it is this weekend! Hundreds of artists. And I am right on the 2nd floor of the Northrup King Building (#274) off the main entrance across from Danish Teak. Such a good place to start your art crawl before art fatigue sets in. I will be showing a retrospective of sorts, a few things from the projects I have been working on the past few years. I have a beautiful cherry blossom photo that you probably have not seen before, and a really dramatic iceberg panorama from last year's trip to Iceland. If you stop up to the 3rd Floor of NKB where the silent auction is taking place, you can bid on my 40x60 inch Geese on the Mississippi River print which has been a staple in my studio for the past three years. It's gonna look good in someone's home, ya? 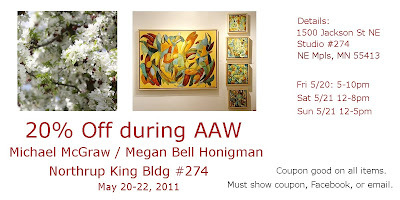 The image for this post is a coupon which you can use for anything in the studio - including Megan Bell's paintings. There might be some limitations we haven't thought of, but stop by and see what 20% off will get you.